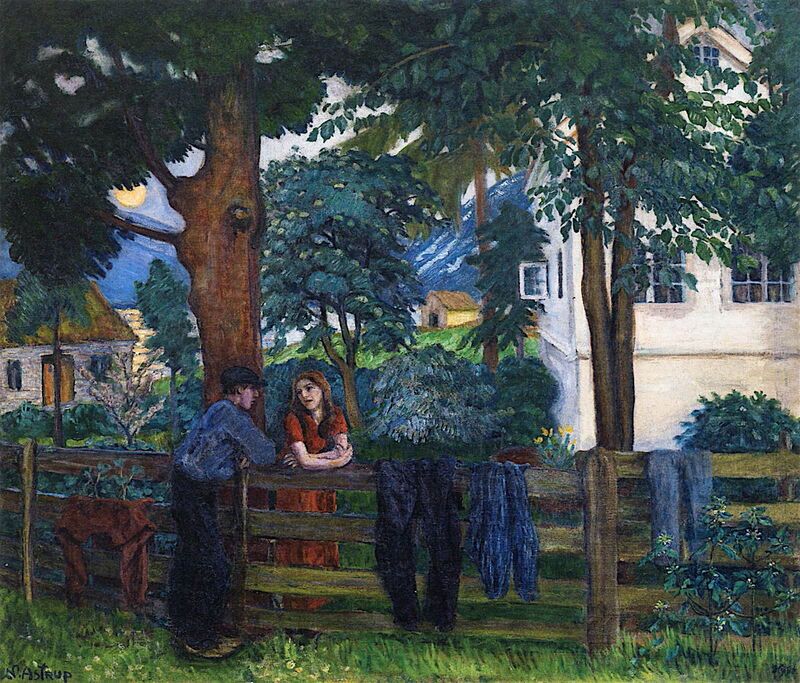 Nikolai Astrup (1880–1928), Birthday in the Parsonage Garden (1911-27), oil on canvas, 130 x 159 cm, Bergen Kunstmuseum, KODE, Bergen, Norway. The Athenaeum. 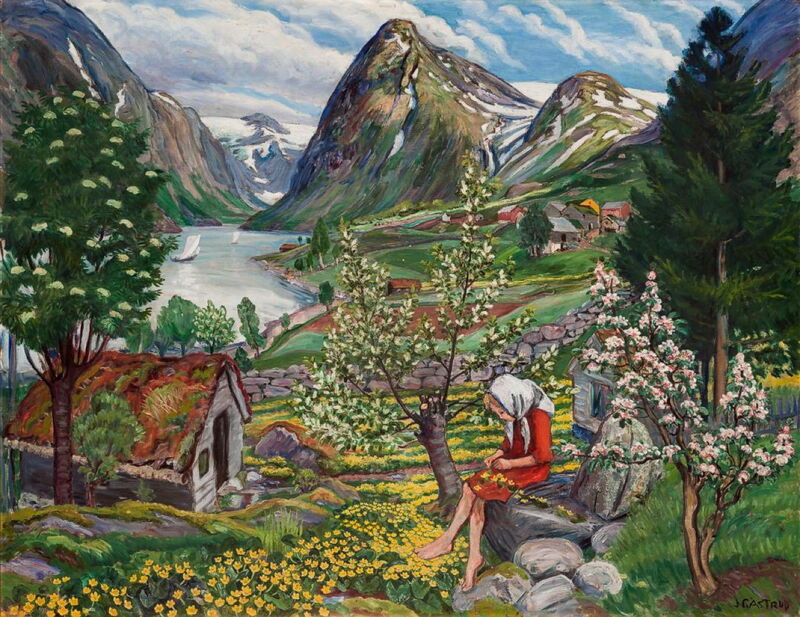 Early in 1911, Nikolai Astrup (1880–1928) had his third solo exhibition, this time in Oslo. After his previous runaway successes, he was perhaps a little disappointed that some critics were less enthusiastic than before. This fuelled his self-doubt, and he used the support of a travelling scholarship to study in Berlin. Berlin was at the height of the Secession at the time, and while he was there, Astrup studied the works of major contemporary painters including Henri Matisse, Max Slevogt, and of course Lovis Corinth. He also spent some time in a private art school, but later wrote that Corinth and the ‘other professors’ were of no help to his development. Nikolai Astrup (1880–1928), Moonlight at Hegrenes (c 1911), oil on canvas, 59 x 73 cm, Private collection. The Athenaeum. Astrup’s time in Berlin led to more experimentation in his painting, including the use of strident colour and more complex perspective. Moonlight at Hegrenes (c 1911) marks the start of these changes, with its light orange moon glimpsed through the trees, its reflection broken on the lake beyond the village. 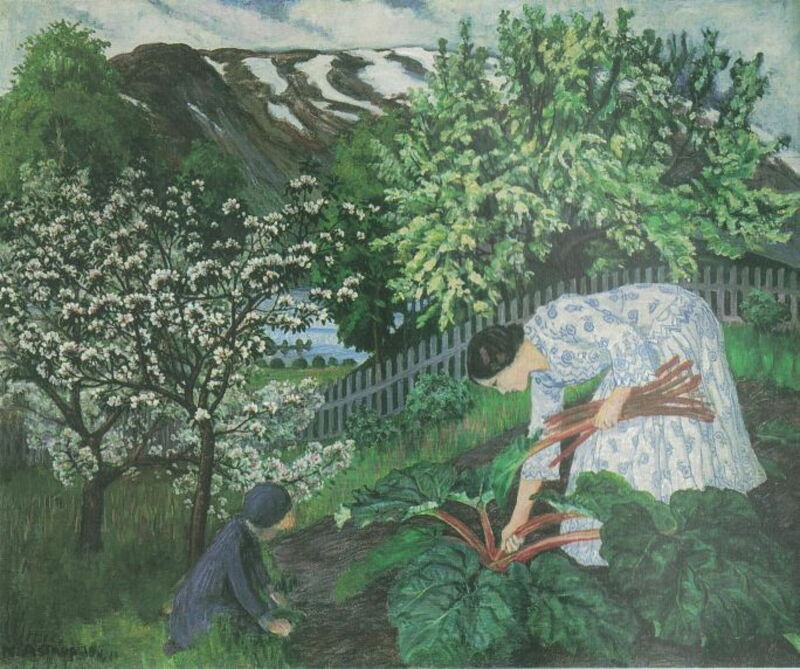 Nikolai Astrup (1880–1928), Rabarbra (Rhubarb) (1911), oil on canvas, 93 x 110 cm, Bergen Kunstmuseum, KODE, Bergen, Norway. Wikimedia Commons. Although Rabarbra (Rhubarb) (1911) has more muted colours, its projection is complex, and the distinctive fell in the background has no aerial perspective, bringing it closer to the viewer. This also must be one of the first paintings to show the cutting* of rhubarb stems in a garden, which appears to be similar to the patch seen being worked in his A Night in Spring (1909). Rhubarb was originally grown for the medicinal properties of its root, and at the time of Marco Polo was one of the more costly imports to Europe. When sugar was hard to come by, its bitter stems were seldom used for cooking. This changed in the eighteenth century, and as sugar became more plentiful, rhubarb stems were first a delicacy, then a popular crop in kitchen gardens throughout Europe and America. The Astrups’ first child, a daughter, was born in 1911, and the family moved over to the other (south) shore of Jølster Lake, to live in Myklebust. In early 1912, some of his paintings were exhibited in Vienna. 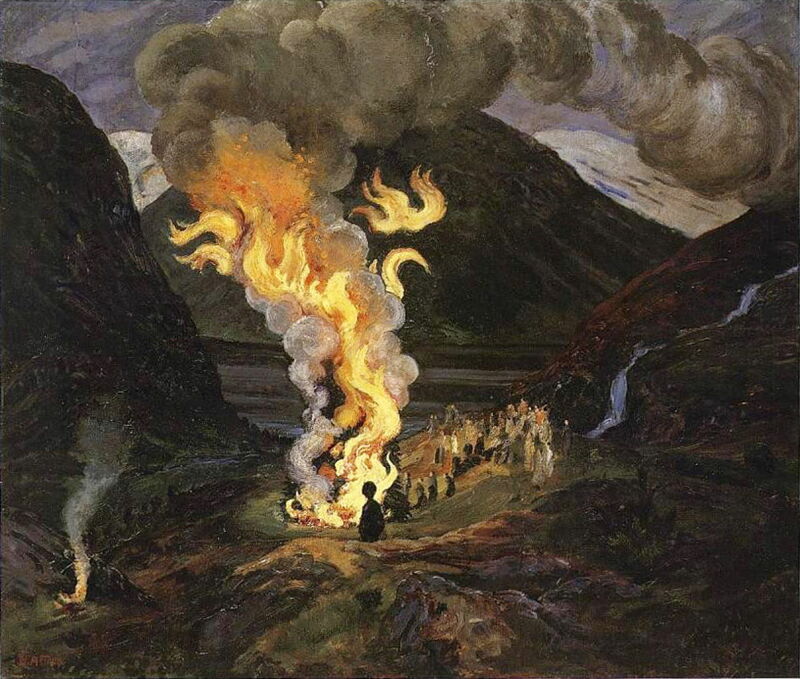 Nikolai Astrup (1880–1928), Jonsokbål (Midsummer Eve Bonfire) (1912), oil on paper on cardboard, 89 x 105 cm, Nasjonalgalleriet, Oslo. Wikimedia Commons. Jonsokbål (1912) is one of the finest of his paintings of the Midsummer Eve celebrations. It has now grown quite dark, and this bonfire is well back from the lake shore, where the land is rough, and rising into the hills. Clumps of flames are shown breaking away from the main column of fire, as if they have a life of their own. The event has become more magical, reverting to its pagan origins, perhaps. In 1913, the Astrup family had to move from Myklebust along the south shore of Jølster Lake to Sandalstrand. They had bought a smallholding there, but it lacked suitable accommodation and a studio, which they had to build over subsequent years. Nikolai Astrup (1880–1928), A Bird on a Stone (1913), oil, dimensions not known, Henie Onstad kunstsenter, Bærum, Norway. Wikimedia Commons. A Bird on a Stone (1913) is a motif which probably originated in his painting March Atmosphere at Jølstravatnet (before 1908), with which it has many similarities, although that earlier painting shows a slightly different background, and lacks the greenery in the foreground of this painting. Astrup then turned that into at least two different woodcuts, with a strong element of japonisme. 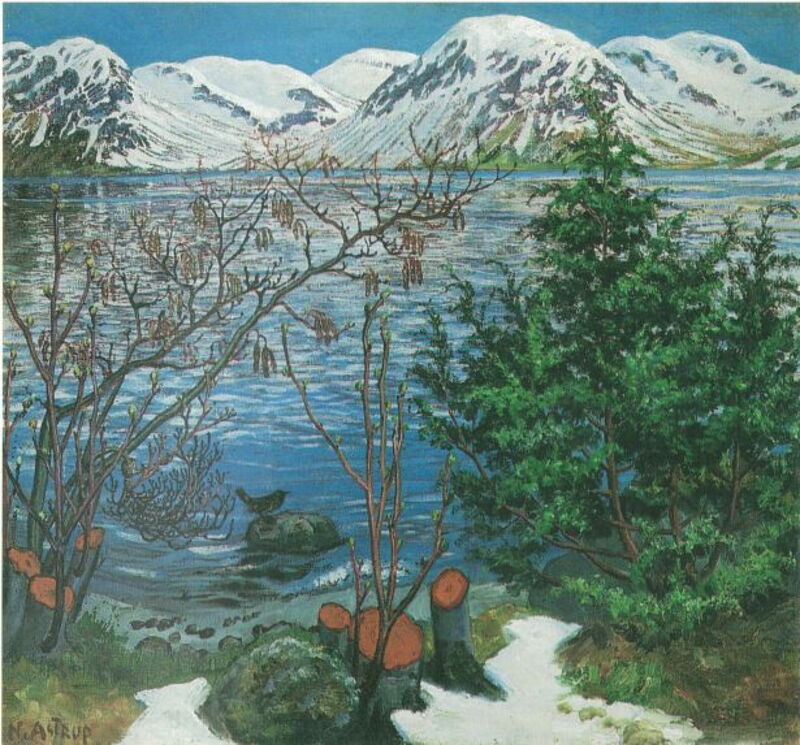 Following success with woodcuts, Astrup quite often revisited his original painting, and made a new version of the painting which was derived more from the print than the original painting. He followed this unusual sequence with several other motifs, including Going to the Mill (c 1900-05) which became the painting Milling Weather (1916), which is reversed from the original, and Foxgloves (1909). 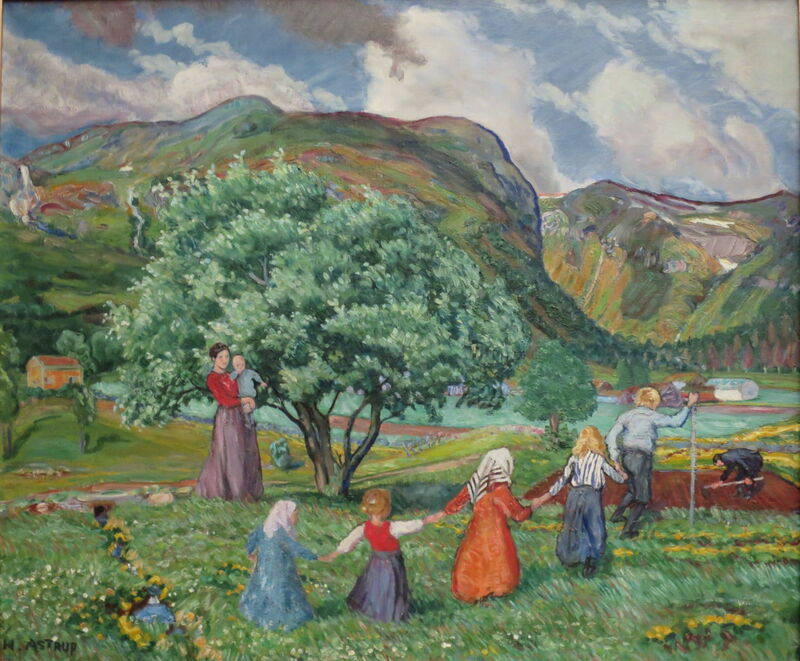 Nikolai Astrup (1880–1928), Summer and Playing Children (1913), oil on canvas, dimensions not known, Bergen Kunstmuseum, KODE, Bergen, Norway. Wikimedia Commons. Summer and Playing Children (1913) shows how his more familiar motifs were being expressed with looser brushstrokes during this period. In 1914, the Astrups’ second child was born, a boy. Nikolai started making woodcuts more seriously, and in greater quantity. Nikolai Astrup (1880–1928), The White Horse in Spring (1914-15), oil on canvas, 90 x 105 cm, Nasjonalgalleriet, Oslo. Wikimedia Commons. 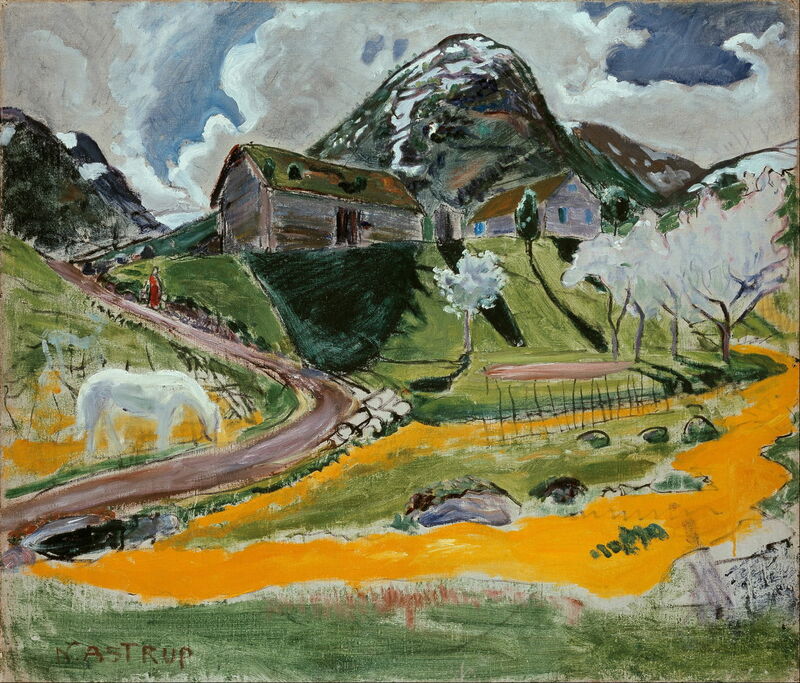 Astrup’s experiments with strident colour and sketchy facture reached their peak in this, The White Horse in Spring (1914-15). In parts his application of paint has become so thin as to miss areas of canvas altogether. The white horse is echoed in the blossom of the trees opposite, and a figure in red who is descending the hill becomes a brief daub of contrasting hue. Astrup’s work was exhibited in Gothenburg and Copenhagen, and in the Norway section of the 1915 Panama-Pacific International Exposition, in San Francisco. Nikolai Astrup (1880–1928), Christmas Eve at Sandalstrand (1918), woodcut print on paper, 33.8 x 50.5 cm, Private collection. The Athenaeum. Few of his woodcut prints can be dated particularly precisely, so I will show most in a later article, out of chronological sequence. However, Christmas Eve at Sandalstrand seems to have been confidently dated to 1918, and shows his wife and young son asleep in their home. Nikolai Astrup (1880–1928), Kari – Motif from Sunde (c 1918), oil on canvas, dimensions not known, Private collection. The Athenaeum. His prints were clearly influencing his painting style at this time, too. 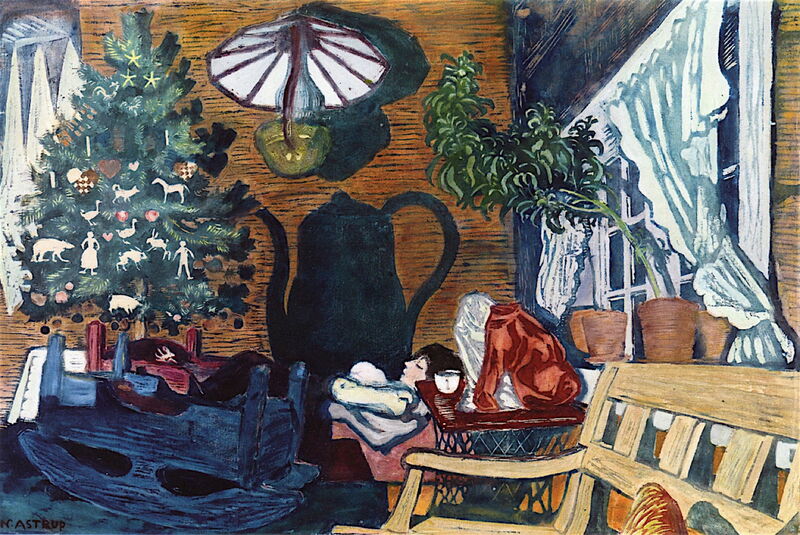 Kari – Motif from Sunde (c 1918) shows an elfin figure of a girl who has been painted as if in an illustration, or perhaps one of Carl Larsson’s popular albums. 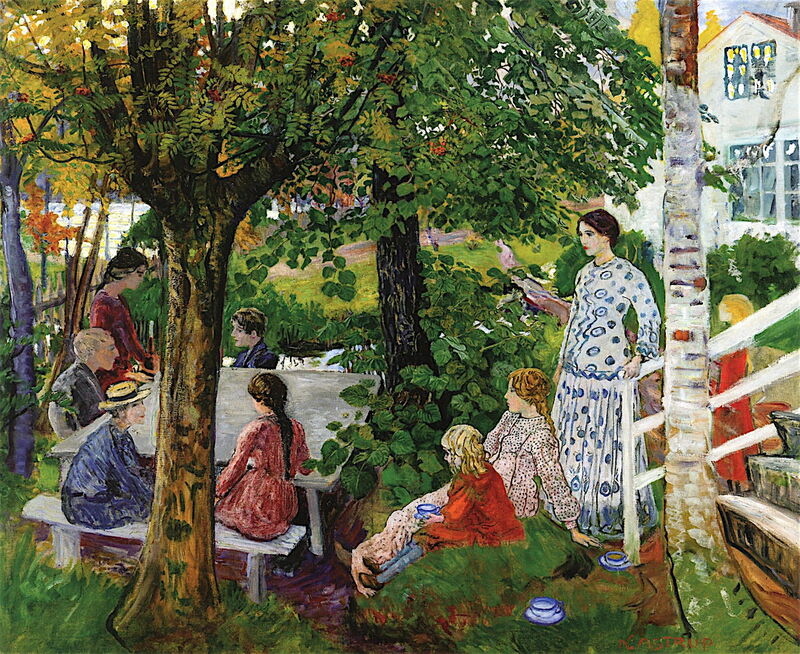 Birthday in the Parsonage Garden (1911-27) is one of Astrup’s most personal paintings, which he started in 1911 and continued to work on for the rest of his life. It shows what must have been one of the last of the family gatherings in the garden of the parsonage at Ålhus, and the scene and its figures were his visual link to his past. It too adopts an almost illustrative style, which has been compared to the work of Carl Larsson and Maurice Denis. Larsson was a commercially-successful Swedish artist whose paintings were published in the period 1899-1920 in albums such as A Home, which sold very well throughout the Nordic countries and in Germany. 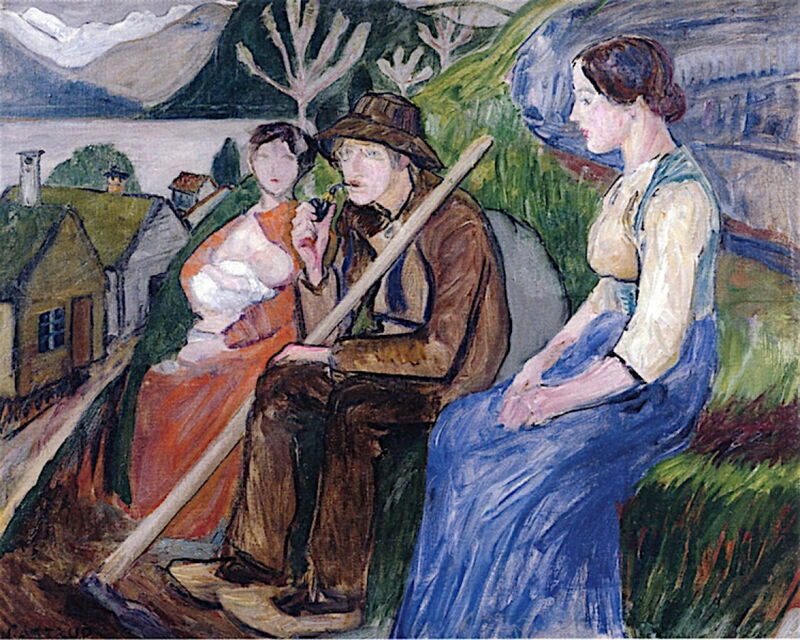 Nikolai Astrup (1880–1928), Self-Portrait at Sandalstrand with Engel and Her Sister (1919), oil on canvas, dimensions not known, Private collection. The Athenaeum. Self-Portrait at Sandalstrand with Engel and Her Sister (1919) gives another glimpse into Astrup’s personal life. Here he sits, puffing on his pipe and staring into the distance. Deeper into the painting, Engel, his young wife, is nursing another baby at her breast. At the right, dressed in blue and clearly at a great distance from the world around her, is Engel’s sister. However, that image of tranquillity in the landscape was idealised. Astrup’s health had not been good, and he was clearly unhappy. In 1919, he had to postpone indefinitely plans to travel abroad using a travel grant. For a while, he seriously considered emigrating to the US. * An anonymous reader points out that you do not “cut” rhubarb but “pull” it. Nikolai Astrup research (English and Norwegian). Astruptunet, the artist’s house and museum (Norwegian with some English). Carey, Frances, Dejardin, Ian AC, & Stevens, MaryAnne (2016) Painting Norway, Nikolai Astrup 1880-1928, Scala. ISBN 978 1 85759 988 6. Posted in General, Painting and tagged Astrup, Backer, Corinth, Denis, Gude, japonisme, landscape, Larsson, Matisse, Norway, painting, rhubarb, Rousseau, Slevogt. Bookmark the permalink.